The 2020 Jeep Gladiator that bowed Wednesday at the 2018 LA Auto Show is the long-rumored pickup truck version of the popular Jeep Wrangler off-roader. Except it’s more than just a four-door Wrangler with an open bed—much more. The Gladiator stretches a hefty 30 inches longer than the biggest Wrangler. At 218 inches from bumper to bumper, the Gladiator splits the difference between the short- and long-bed versions of the Chevy Colorado crew cab. Jeep got to that extra length by adding 19.4 inches of steel to extend the 2020 Gladiator’s wheelbase. Nearly a foot of frame was grafted on behind its rear wheels to accommodate its five-foot steel bed. No single-cab version of the Gladiator will be available. That length isn’t good for the Gladiator’s breakover angle (20.3 degrees for the Gladiator Rubicon compared to 22.6 degrees for the Wrangler Rubicon) or its departure angle (26 degrees for the Gladiator Rubicon versus 37 degrees for the Wrangler Rubicon), but that’s the tradeoff for more utility. The Gladiator’s bed will be available with a factory-applied bedliner, cargo partitions, a power outlet, and a tonneau cover—all for an extra cost, of course. 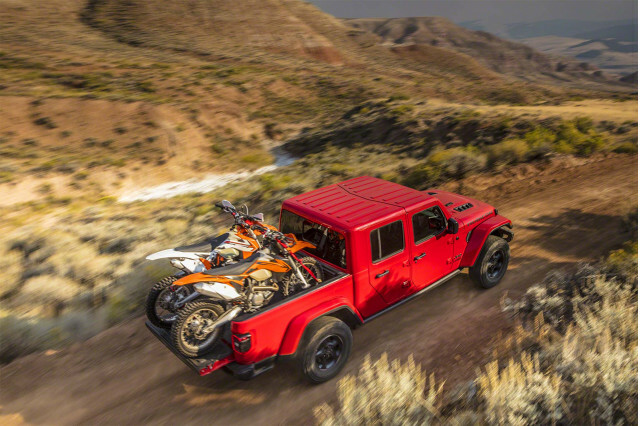 Underhood, the Gladiator will come standard with the automaker’s familiar 3.6-liter V-6 rated at 285 horsepower and 260 pound-feet of torque paired to either a 6-speed manual or an 8-speed automatic transmission. Four-wheel drive with a part-time, two-speed transfer case is standard. Gladiator Rubicons swap in a beefier transfer case with a low gear even better suited to serious four-wheeling. 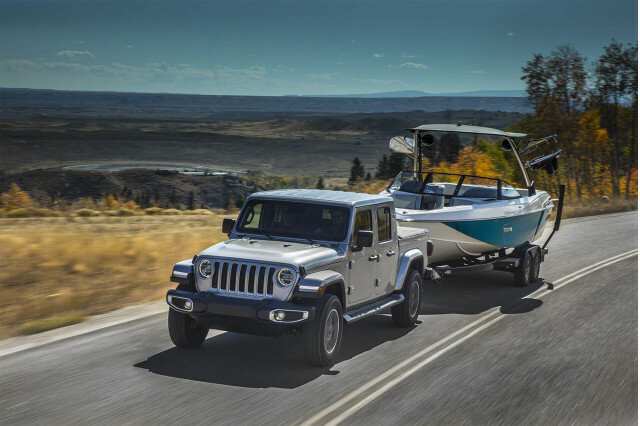 As in the Wrangler, the Rubicon trim includes wider Dana 44 axles with electronic differential locks, 33-inch all-terrain tires wrapped around 17-inch alloy wheels, and sway bars that disconnect at the tap of a button for better axle articulation. 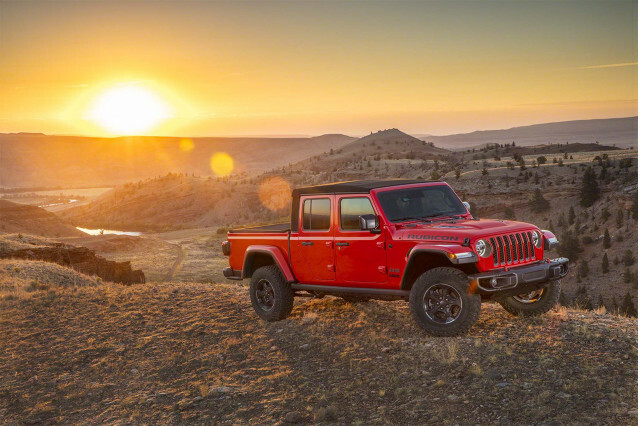 In 2020, Jeep will offer the Gladiator with a 3.0-liter turbodiesel V-6 rated at 220 hp and 442 lb-ft of torque mated exclusively to the 8-speed automatic transmission. Jeep won’t offer the Gladiator with the turbo-4 that’s optional in the Wrangler. Jeep is remaining mum on towing ability with the upcoming turbodiesel, but the gas V-6 is no lightweight. With an optional tow package and the automatic transmission, it’ll be rated to lug as much as 7,660 pounds worth of trailer. Payload capacity varies from 1,100 to about 1,600 pounds depending on trim level and options selected. Speaking of trims, the Gladiator will be offered in just three levels: Sport, Overland, and Rubicon. The Sport trim is relatively spartan with its roll-up windows and 5.0-inch touchscreen for infotainment, although power windows and a 7.0-inch touchscreen with Apple CarPlay and Android Auto are on the options list. Those features come standard on the more lavish Overland, which offers leather seats as an option. The Rubicon’s four-wheeling bits are augmented by bigger fender flares capable of housing 35-inch tires, a popular aftermarket upgrade. Jeep also made the spare tire well—under the bed between the frame rails—wide enough to accommodate a 35-inch tire, too. inside, the Gladiator mirrors the Wrangler—at least until the rear seat. 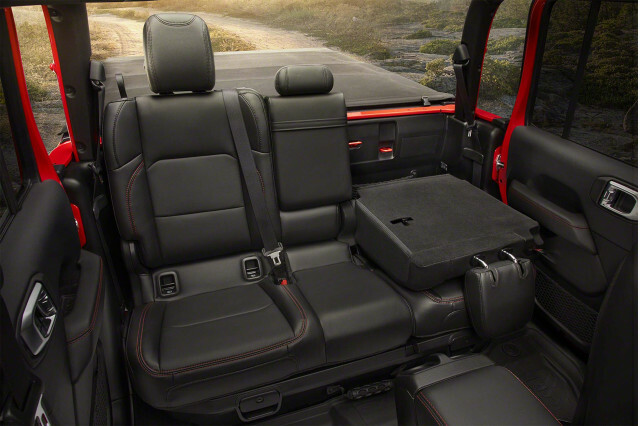 The rear seat’s 38.3-inch legroom is the same as the Wrangler, but its base folds up stadium-style to reveal a pair of storage pockets. The seatbacks also fold flat and there is another storage area between the rear of the cab and the seatbacks. Where’s Apple’s Amazon Echo competitor?